Surprisingly, this Lord is a lover, not a fighter. Not to say he never bickers or squabbles, but it's only ever over one thing; your attention. He's not a "lap shiny" per se, but he likes to stick around you. He will be content just to lounge by your side, moving only to glare at another shiny trying to steal his space or to move with you to the next room. His fierce possession of you affection, however, also translates to an extremely loyal bond. If you can put up with his constant presence he will prove one day that it's all worth it with some great feat of bravery and protection. Until then, though, he'll just tuck himself right beside you and never leave, alright? He is a beautiful specimen of an Asid. He will grow to be almost seven full feet but his body will stay impossibly thin and whiplike. He curls up into such tight coils it's rather surprising when he gets up to stretch out to his full length. The pale ivory of his scales is just shy of white, but not translucent like an Albino. Not to mention it would be hard to mistake him for a Queen with the top half of his head covered in an inky, shiny black. This color is only found elsewhere on the tip of his tail His eyes are a pale, ice blue that will always reflect the winter day he was brought into the world. True to his rank, he’s a lanky seven feet and change, with see through skin. Every muscle and tendon is visible though his shining hide, and if he rears up you can see the twitching shadows of his living organs. Look at him, he wants you to look since it makes him feel special. Feeling special is a good thing, even if he hasn’t really done anything to deserve attention and admiration. He likes to pretend he has though. If he were more motivated he’d probably be as nasty as any other Asid, but as it is, he’s too lazy to start trouble. To keep people interested in him he’s become a master at false politeness and feigning concern. The only thing he really cares about is himself though. As far as Asid go, this girl is fairly talkative. She has a tongue of silver, one she probably stole from her wild parents, and she's pretty dang good at using it to her fullest advantage. You see, she's not a commonplace ruffian, a crook, a thief. She's an artist, of the con that is, and proud of it. She's not even secretive, preferring to work her magic in plain sight- far less suspicious that way, y'know? Even if she were to get caught, though she won't, it'd be okay. She's confident (overconfident, really) that she can talk herself out of any situation. You'll catch her practicing on the smaller shinies, the ones less likely to eat her if they do suddenly see the light. She'll also sell you her own tail if you'll buy… and then steal it right back the moment you blink. The majority of her body is covered in dark purple scales, almost black, but in the light the smoky magenta shines through bright and clear. Her underbelly is a paler shade of gray-lavender, the color stretches up her neck and goes over her nose in a thin blaze that forks off to cover her pale golden eyes. She always has this sly, toothy smile on her reptilian muzzle. Don't let her small frame fool you though- her tail is strong and whiplike, and has a somewhat prehensile quality to it that allows her to bring small objects closer to her. A smidgen larger than five feet, maybe an inch or two, this Risen has clearly had to fight through life. He's all decked out with muscles beneath his golden hide, which is radiant and shines with health. The white that laces through his body are particularly concentrated on his thighs and around his shoulders, taking on doily-like patterns. His eyes are a luminous green, standing out particularly in the dark. The black line on his brow is thick, just as his body is, giving him a strong look. For a shiny that's been through a lot in his lifetime, Hatfield has never once complained about it. Sure he's big (for his rank) and burly but he's rather good-natured and polite. He comes from a land that is definitely not nearby, and is rather eloquent for his species. He's got his etiquette as well, no elbows on the table, eye contact when speaking to others and the likes, and he's rather friendly and willing to meet others (though he is a baby bit shy). No matter what threatens to bring him down, Hatfield is always determined and ready to bounce back and make the best out of it. Whatever doesn't kill him makes him stronger doesn't it? And with his super positive outlook of life, he's ready to tackle the world and then some. He's also pretty keen on learning more about things that he isn't the best at and is more than willing to accept that others are better than him in some aspects. A teacher can be found in just about any shiny or humanoid right? He's also more than willing to lend a paw to others, it's his pleasure to help out! He's more content to settle down than embark on adventures, honestly, but if he's got to guide more shinies through jungles or any rough terrains, he's ready! He may struggle to remember things that he's not particularly good at (like cooking) but mind you he'll keep trying until he gets it (almost right). And he'll enjoy every minute of it! Finding a lovely lady to settle down with is a wonderful thought is it not? And well, isn't he just dreamy? A unique little boy, this Risen is a quirky, but pleasant guy. He has a great sense of humor, always chuckling at things and looking optimistically at life. He’s odd in the sense that he has a lot of random ideas and unrealistic things that he wants to do. One day he wants to be a master fighter and the next he ones to learn how to bake with claws. He tends to pounce on things, more like a dog than a lizard, and he’ll gladly ride around on your shoulders or in your bag. He’s empathetic and loyal, but when it comes down to it he’s a bit cowardly in dangerous situations. But he will always try his best at everything he does. 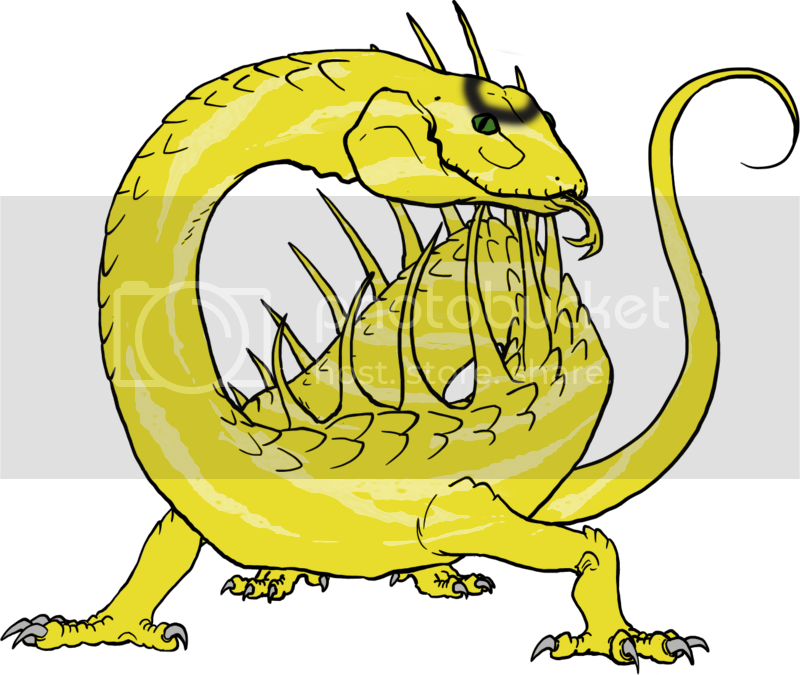 The color of his scales are a bit paler than most Risens, looking more like a strong yellow than gold. The markings on his body come in whirlpools of white, some overlapping just enough to make it look like one consistent layer of thin swirls. His pleasant appearance is topped off with gentle green eyes that might remind one of spring. He’s tiny, almost reaching five feet but falling a bit short. That makes him the perfect lap-shiny. A bit over five feet long, too much of it tail, to say that he’s awkward is putting it too nicely. It’s a shame that he’s so awkward since he really is sort of pretty with his golden scales more iridescent than metallic and his ‘halo’ marking a series of amazingly thin concentric circles. The thing is, you can’t trust him alone with anything, especially fragile objects. None of it’s malice, he just seems good at breaking things, especially appliances. He wants to find out if the little light in the refrigerator stays on when the door is shut or what plays the music in the radio. If you don’t use technology he’s perfect for you, amazingly helpful around the house even if he tends to drop and spill things. Risens might be compassionate, but in this fellow's case that compassion only goes so far. Nobody ever said he was completely sincere about all of it it, and he is in fact one of the most condescending Asids you're likely to come across. He might compliment you in the most exaggerated manner, or he might agree to follow a request you make of him if only because he thinks you're literally incapable of it yourself, but his eye-rolling conviction that you are too stupid to dress yourself in the morning is thinly veiled at best. He is five and a quarter feet of natural golden hide, smoothly marbled with silvery and faintly rosy off-white alike. His halo is not true black but a particularly dark shade of grey, a perfect circle that shines as if polished, and considering the nacreous quality of his hide, all of him very well might be.